As part of their “Solo in Stereo” tour, the husband-and-wife duo are traveling the country without a backing band and reworking most of their classics. 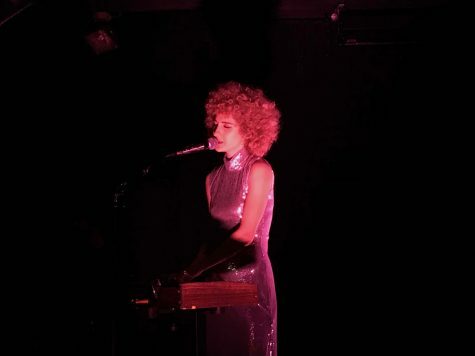 Denver-based indie pop outfit Tennis dazzled (Le) Poisson Rouge on Tuesday night with an ethereal headlining set. Departing from the comfort of a full band, husband-and-wife duo Alaina Moore and Patrick Riley embarked alongside each other to play demo arrangements of their most beloved tracks. 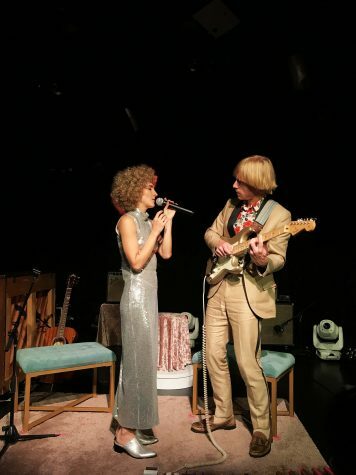 Dressed in a glimmering disco ball style gown and proudly donning her signature blonde hairdo, Moore took to the stage alongside Riley, looking equally as retro in a tan suit with black lapels layered over a floral button-down shirt. With baby blue chaise stools, velvet drapery, a vintage wooden piano and a multitude of plants adorning the stage, one could have mistaken the intimate LPR for a serene and romantic Studio 54. 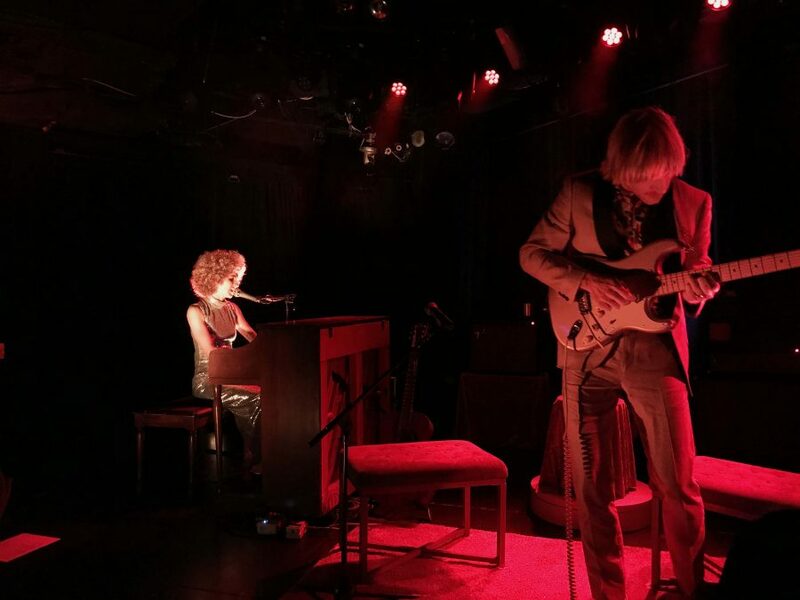 Opening with “10 Minutes 10 Years,” a track off of their most recent album “Yours Conditionally,” the two gave new life to their discography, playing songs new and old in a softer, reimagined light. With the intensity turned down a notch and tenderness multiplied by 10, they powered through a curated setlist that lent itself perfectly to the more intimate setting. Straying from a solely acoustic show, as Moore explained on stage that she is a maximalist, the two utilised drum loops and effects pedals throughout the set, with Moore singing and alternating between a keyboard, piano and acoustic guitar, and Riley playing a gold Fender Strat. The gentle sensitivity in Tennis’ lyrics paired with their sweet simple melodies gave the stripped back performance a dreamy, romantic feel. Like sung poetry, Tennis took the crowd on a journey of friendship, marriage and frustration, all underscored by the pure, apparent love Moore and Riley share. The enamored pair seemed to play for only each other while performing, the crowd simply onlookers into a tender exchange of love shared by the husband and wife. Roughly halfway through the set, Moore paused and opened up the floor for a mini Q&A session, a tradition the band has embraced during this tour cycle. The crowd was eager to interact with the couple as hands raised with gusto throughout the audience, and Moore answered questions about her personal style icon Patti LuPone, favorite Skittles flavor — Alaina doesn’t like candy — and the go-to meal on a sailboat: anything canned. As the set tapered, Moore introduced “Timothy,” a heartfelt open letter to a critic whose negative review of an early album left a profound impact, remarking that “revenge is best served in the key of D.” The pair concluded their performance with “Please Don’t Ruin This For Me” and returned to the stage for their encore “Island Music,” which featured Moore singing while rotating on a spinning seat, Riley broodingly playing guitar alongside her. The “Solo in Stereo” tour was truly an ode to the tried and true Tennis fans out there, a dedicated hour to celebrate the best of Moore and Riley where the relaxed interpretation of their lovingly tender verse and full-bodied, blissfully sunny melodies seemed to take you on a journey back in time to a warm ’70s summer.